The ups and downs of college football. Auburn has experienced it all the last four years. In 2010, Gene Chizik guided the Tigers to a 14-0 season and BCS championship. Two years later, he was fired after the Tigers went 3-9. Enter Gus Malzahn, who resurrected the program in one season. Auburn finished 12-2 and came within a whisker of beating Florida State in the BCS title game. The Tigers' trip to Kansas State on Sept. 17 promises to be one of the better nonconference games. Wiz correspondent Greg Laughlin made the trek from Honolulu to Auburn for Saturday night's game between Washington State and the hometown Tigers. Auburn won, 31-24, in the debut for coach Gus Malzahn. 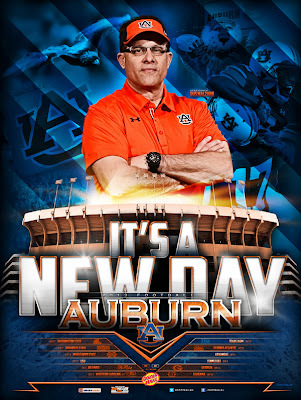 It is Gus Malzahn's job to put Auburn back together. The new coach takes over for Gene Chizik, who was ousted after a 3-9 season. It was a stunning fall for Chizik, who guided the Tigers to the BCS title in 2010. Malzahn was Chizik's offensive coordinator, but he left after the 2011 season and accepted the opening at Arkansas State. After losing three of their first five games, including defeats at Oregon and Nebraska, the Red Wolves won their last eight. Meanwhile, Auburn was in freefall, going winless in Southeastern Conference play and beating only Louisiana Monroe, New Mexico State and Alabama A&M. With rival Alabama headed for its third BCS title in the Nick Saban era, Auburn officials had seen enough. Chizik was let go and the call was made to Malzahn.